Before You Swat That Spider….! Yes, yes, I know. Spiders are small, creepy things that skitter about on eight legs and crawl up your sleeve when you’re not looking. They are perceived as venomous—and surely, some of them are. The Brown Recluse packs so much venom in its tiny body that its bite will cause horrible damage or even death to the unwary. And the Black Widow is not only a dangerous creature but prone to appear uninvited. My daughter in law found one lurking in her mailbox not too long ago! Still, you have to admit that spiders can do some extraordinary things. I saw a spider web this morning with the sun shining against last night’s raindrops, and it seemed a creation of lace and diamonds. I marveled that the tiny creature in the middle of this web had started its architectural feat by tossing into the wind a single very strong line drawn out from its own silk glands! Spidey’s role in other countries has been mixed: contrast, if you will, the spider that scared Miss Muffett to the nice arachnid in Charlotte’s Web. Norsemen considered spiders to be the Weavers of Man’s fate while ancient Greeks mythology told the tale of Arachne whose conceit inspired Athena to turn her into a spider. In West Africa Anansi is a trickster god—an idea shared by Native Americans in the Plains who also considered the spinner to be a rough and tumble character. Not so the Southwestern tribes, who felt spiders were associated with art and weaving, or the Ojibwe, who felt that webs were dream catchers. And in far away in Scotland there is that story of Robert the Bruce who, while hiding in a cave from his enemies, almost despaired of leading his countrymen to victory until he saw the tenacity and resolution of a spider making its web. In my parents’ home back in Japan, there were two, big, harmless spinners which my mother— who had a fondness for all living things—named Jack and Jane. The two lived with us for many years until Mike, who was visiting, swatted Jack in the bathroom. It was in Japan, too, that I heard another folktale concerning arachnids. This was the story of a murderous brigand who had never done a decent thing in his life until one day he came upon a spider and, moved by some sense uncharacteristic kindness, did not kill it. Eventually the brigand died and was sent packing to a fiery pit from which there was no escape. But, wait! From above dangled a single strong strand made by the very spider whose life he had saved! Joyfully, the brigand reached for the strand and began to haul himself up. Up and up he went until he could almost see Paradise awaiting him, but before he could reach the Pearly Gates he chanced to look down and realized that many other damned souls were also hauling themselves upward. “Get away!” Snarled the brigand, “Get off! This MY ticket out of here, not yours!” At which point the strand broke and cast them all back into the fiery pit. I know, Dorothy. Me, too! But it’s interesting, don’t you think? Even spiders have their fan club! Love the story and the watercolor Maureen! ditto from Linda’s comment. maureen: i love the story. so well written. 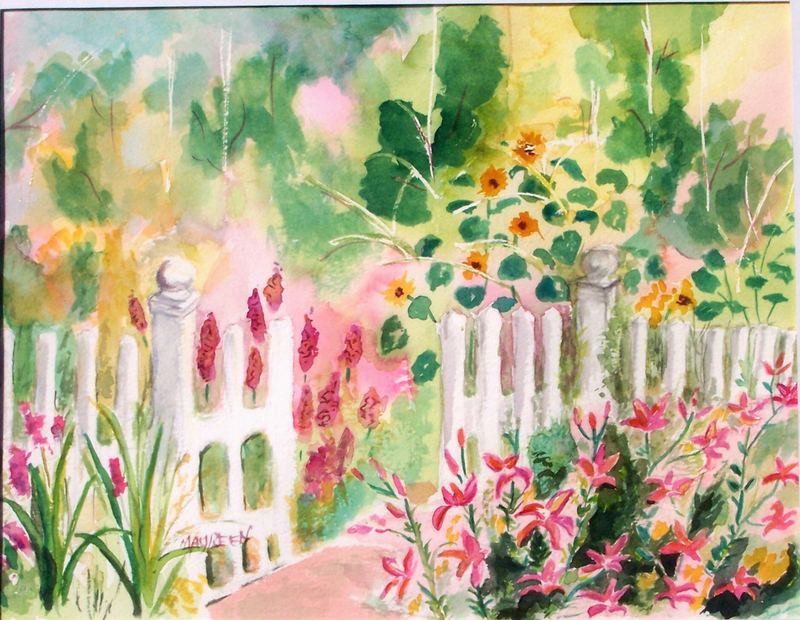 and the water color of the ” spring garden.’ i think i have some of your note paper with this print on it.! +++ i am just getting rid of upteen emails from months of them collecting. and i saw your latest blog which i had not read. tell me. on another subject… did you send out the Peta communication about the snakes and alligators? i was stunned to learn how terrible the people who kill them for fashion items did that terrible deed. i am never going to buy an item with the skins of an animal again. but of course, i never have so far. except for cow leather… .How nice to have the option of the beautiful prints we can choose in fabrics. And, after you taught me how to make those lovely purses, i shall always be using my fabrics to make any purses i use. Thank you, Donna!No, I didn’t talk about snakes and alligators, but I agree with you that creatures have a right to the skins they were born with! There are so many synthetics around… no need to wear something that ‘someone’ has worn before! If possible, I capture the spider on a Kleenex or paper towel and deliver him safely outdoors. Thanks for sharing. I know your parents missed their pet spiders.